In May 2018, UNICEF, WHO and World Bank Group released the 2018 edition of the joint child malnutrition estimates for the 1990–2017 period, representing the most recent global and regional figures. A suite of on-line interactive dashboards were developed to enable users to explore the entire time-series (1990 – 2017) of global and regional estimates of prevalence and number affected for stunting, overweight, wasting and severe wasting. These estimates are presented by various regional and income group country classifications used by various agencies including the United Nations, UNICEF, WHO and The World Bank Group. All estimates are presented with 95 per cent confidence intervals to show the level of uncertainty around them. These intervals are important to consider when interpreting estimates. The 95 per cent confidence interval highlights the range within which one can be 95 per cent certain that the true value lies, and can be used for assessing significant changes across time or differences between regions. A wider interval reflects higher uncertainty, usually caused by data scarcity or heterogeneity within the region for the specific indicator. The inter-agency team released new joint estimates for child stunting, overweight, underweight, wasting and severe wasting (May 2018 edition) using the same methodology as in previous years. These new estimates supersede former analyses results published by UNICEF, WHO and the World Bank Group. Given that country data are at maximum available from surveys conducted in the year previous to when the modelling exercise takes place, in 2018 the joint estimates were derived up to 2017 with extrapolation for stunting until 2025. 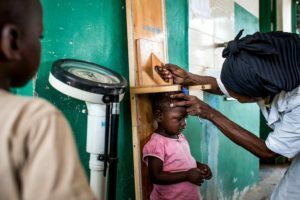 The report indicates that in 2017, there were 151 million stunted children and 51 million wasted children while 38 million children were overweight. The report covers measures of child malnutrition used to track progress towards the child nutrition targets of Sustainable Development Goal 2. The estimates indicate that global progress in stunting has been steady, but not fast enough to reach targets. Meanwhile, the number of overweight children worldwide has seen no decline in more than a decade. These new estimates suggest that progress is possible. However, they also indicate that we are still far from a world without malnutrition and that current efforts need to be scaled up if global nutrition targets for children are to be met. Good nutrition allows children to survive, grow, develop, learn, play, participate and contribute – while malnutrition robs children of their futures and leaves young lives hanging in the balance. Stunting is the devastating result of poor nutrition in-utero and early childhood. Children suffering from stunting may never attain their full possible height and their brains may never develop to their full cognitive potential. Globally,approximately 151 million children under 5 suffer from stunting. These children begin their lives at a marked disadvantage: they face learning difficulties in school, earn less as adults, and face barriers to participation in their communities. Wasting in children is the life-threatening result of poor nutrient intake and/or disease. Children suffering from wasting have weakened immunity, are susceptible to long term developmental delays, and face an increased risk of death, particularly when wasting is severe. These children require urgent feeding, treatment and care to survive. In 2017, nearly 51 million children under 5 were wasted and 16 million were severely wasted. There is also an emerging face of malnutrition: childhood overweight and obesity. There are now nearly 38 million overweight children globally, an increase of 8 million since 2000. The emergence of overweight and obesity has been shaped, at least in part, by industry marketing and greater access to processed foods, along with lower levels ofphysical activity.